Although the costs of new pharmaceuticals are often the subject of critical media coverage, they are rarely juxtaposed with the benefits that these new drugs bring. Among other things, new research presented in this Research Paper investigates the impact that pharmaceutical innovation had on utilization of hospital care by cancer patients in Canada from 1995 to 2012. Although the costs of new pharmaceuticals are often the subject of critical media coverage, they are rarely juxtaposed with the benefits that these new drugs bring. Between 1995 and 2012, life expectancy at birth in Canada increased by more than three years and curative care hospital discharges per 100,000 population (a measure of hospital utilization) decreased by 25%. While these improvements naturally have multiple sources, a substantial and growing number of studies have demonstrated that pharmaceutical innovation is responsible for a large part of such long-term improvements in health and longevity. Furthermore, although new drugs can appear expensive when considered in isolation, pharmaceutical innovation leads to cost savings elsewhere in the system through the reduced use of health services like hospitals and nursing homes. Studies have also shown that pricing drugs appropriately is important in sustaining a robust rate of pharmaceutical innovation. The positive impact of pharmaceutical innovation on longevity has been demonstrated repeatedly using different methodologies. One study using patient-level data for 22,000 elderly residents of Switzerland found that people who used newer cardiovascular drugs lived longer than those who used older cardiovascular drugs, with the most conservative estimates finding an increase in longevity between 2002 and 2012 of almost 3 months, at a cost per life-year gained of under US$10,000. Another study using region-level data for 30 developing and high-income countries found that life expectancy increased faster in countries with larger increases in drug vintage (world launch year), with the increase in the fraction of newer drugs consumed accounting for 73% of the increase in life expectancy at birth. A third study, this one using disease-level data for Canada found that the cancer sites (breast, lung, colon, etc.) that experienced more pharmaceutical innovation had larger declines in the premature mortality rate, at an estimated cost per life-year gained of US$2,730. 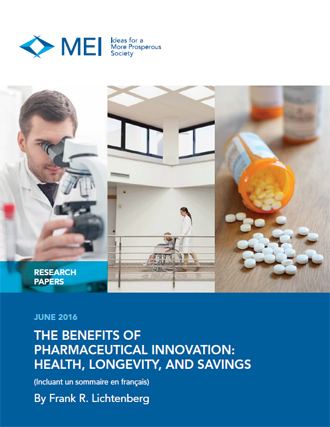 Health status and productivity are also positively affected by pharmaceutical innovation. Work days lost and school days missed per year because of illness or injury in the U.S. declined more rapidly from 1997 to 2010 for medical conditions with larger increases in the mean number of newer prescription drugs consumed. The use of newer prescription drugs also reduced the ratio of the number of workers receiving Social Security Disability Insurance benefits to the working-age population, and has had a positive effect on nursing home residents’ ability to perform activities of daily living. The costs of new pharmaceuticals are counterbalanced by cost savings elsewhere in the system through the reduced use of health services. One study on the utilization of cardiovascular drugs in 20 OECD countries estimated that if the proportion of newer drugs had not increased from 1995 to 2004, per capita expenditures on cardiovascular hospital stays would have been $89 higher in 2004. In comparison, per capita expenditure on cardiovascular drugs would have been just $24 lower with no new cardiovascular drugs. Another study using U.S. data for all diseases found an estimated reduction in hospital expenditure that was more than twice as large as the increase in pharmaceutical expenditure attributable to pharmaceutical innovation. Yet another study found that pharmaceutical innovation also leads to savings in terms of nursing home use. New research presented in this Research Paper investigates the impact that pharmaceutical innovation had on utilization of hospital care by cancer patients in Canada from 1995 to 2012. During this period, the number of cancer patient hospital days declined by 23%, even though the number of new cancer cases diagnosed increased by 46%. The model developed shows that the cancer sites (breast, prostate, lung, etc.) that experienced more pharmaceutical innovation had larger declines in utilization of hospital care. If no new drugs had been registered during the 1980-1997 period, there would have been 1.72 million additional cancer patient hospital days in 2012, at a cost of C$4.7 billion in hospital expenditure, whereas total spending on cancer drugs (old and new) in 2012 was an estimated C$3.8 billion. These pharmaceutical innovations therefore certainly led to substantial cost savings. A number of studies have provided evidence for the hypothesis that, in order to sustain a robust rate of pharmaceutical innovation, financial incentives are required. For instance, the amount of pharmaceutical innovation is positively related to the burden of disease in developed countries but not in developing countries. The most plausible explanation is that incentives to develop medicines for diseases primarily afflicting people in developing countries have been weak or nonexistent. Similarly, the 1983 Orphan Drug Act in the United States, which gave firms incentives to develop drugs for diseases afflicting fewer than 200,000 people, led to increased development of such drugs. A simple theoretical model of drug development suggests that in the long run, a 10% decline in drug prices from the re-importation of cheaper drugs into the U.S. would likely cause at least a 5-6% decline in pharmaceutical innovation. Other estimates indicate that there is a sizable, robust, negative relationship between the penetration of generics and early-stage pharmaceutical innovation. This Research Paper was prepared by Frank R. Lichtenberg, Professor at the Columbia University Graduate School of Business and internationally renowned expert in this field of research.